Since I work pretty long hours and get home well after what some people consider “dinner time”– I get it, Mom. I’m sorry for all of the times I gave you crap for dry chicken and one-pot meals. At the end of the day: simple is the best option. Finding bread that’s not moldy for a PB&J sandwich at 1am after a 14 hour day is pretty close to nirvana for me these days. When I’m hungry and tired and I just need something to eat so I don’t turn into a gremlin (which I readily admit happens if I don’t eat on a regular basis), I remember to just keep it simple. And I work from there. I’m not ashamed to say that I’ve prayed in front of the refrigerator door before. Wishing and willing food to have withstood time, warded off mold, slime and freezer burn is perfectly reasonable, right? Frozen or dried foods would seem to be the answer but I can’t stand the thought eating my dinner from a plastic tray. Or from the microwave. And I like things that are actually green and taste like what they are supposed to. 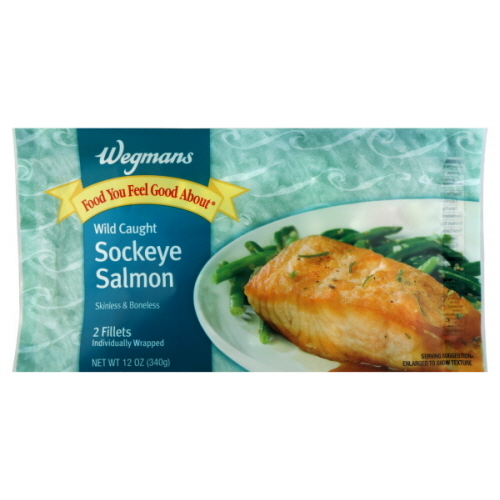 So I’ve been grabbing flash frozen, vacuum sealed pieces of wild caught sockeye salmon from the grocery store and packing them away for desperate times. Wild caught fish is never really going to be cheap but it’s definitely tastier than the stuff in a can, will keep for a couple of weeks when going to the fish market is not an option (or you get home after it closes–I do!) and makes me remember why I love salmon in the first place. This isn’t the oily, petal pink crap you might think of when salmon comes to mind. It’s almost red. Like when someone says “that’s not pink, it’s salmon.” It’s really supposed to that dark. With a little olive oil and a few cloves of crushed garlic, I seared the outside of the fish–careful to not leave any behind when flipping and searched my produce for some citrus only to find that my only lime looked like a kiwi (read: brown and furry and required tongs to get to the trash can). Knowing that the wine I had planned packed enough punch, I dumped the contents of my glass and the some more from the bottle when that burned off. It was light, very crisp, almost grassy and full of the crazy citrus needed to dampen any fishiness from the fillet. Sauvignon Blanc in general is a great wine to use because it hits all of the light citrusy notes you’d want with fish but I really like the Sea Glass Saugivnon Blanc for poaching because it’s pretty inexpensive (less than $10) AND it’s delicious. I’m not much of a white wine drinker so finding one that I like is a big step. My version of simple food is a little different from the pasta dishes I ate as a kid but the heart is still there. It’s quick, clean, healthy and easy. Thaw fish in refrigerator over night (if possible) or thaw under running water (don’t nuke to defrost!!) 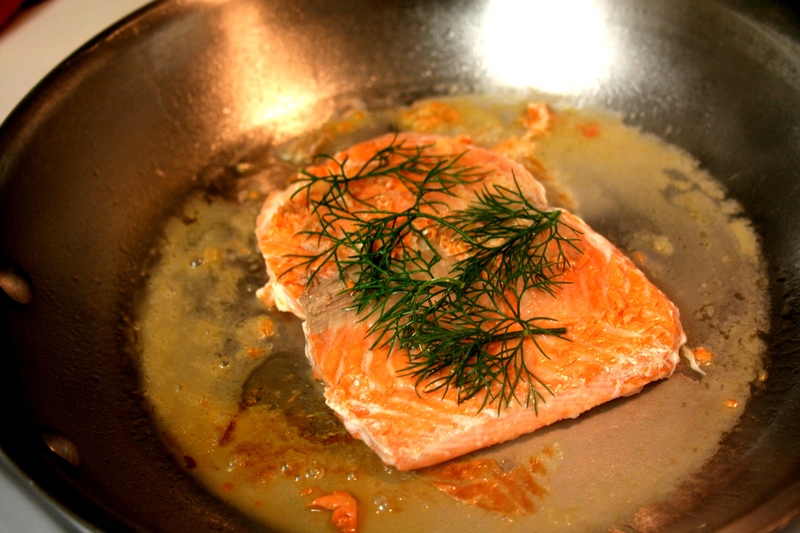 In large frying pan on med-high, heat oil and garlic for about 1 minute–stirring to prevent garlic from burning. 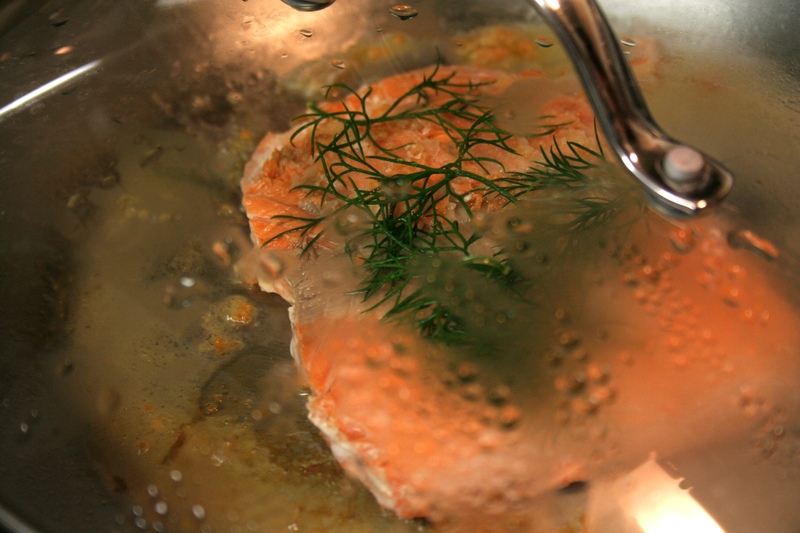 Place fish in pan and cook for about 2 minutes or until beginning to brown. Carefully, flip with a spatula and cook 2 more minutes until brown. Lower heat, add wine (if you forget to lower the heat, you’ll know why I said to do it), and some dill, cover and cook on medium for about 8 mins or until fish flakes easily when pushed with the side of a fork. In the meantime, rinse off your lettuce (I like to chop mine and put in a bowl of ice water to let it get crispy, but to each his own), cut up tomatoes and other salad accoutrements and pick your dill. I also like to toss some herbs in with the lettuce (dill, cilantro, mint are great surprise bites) if you have them readily available. 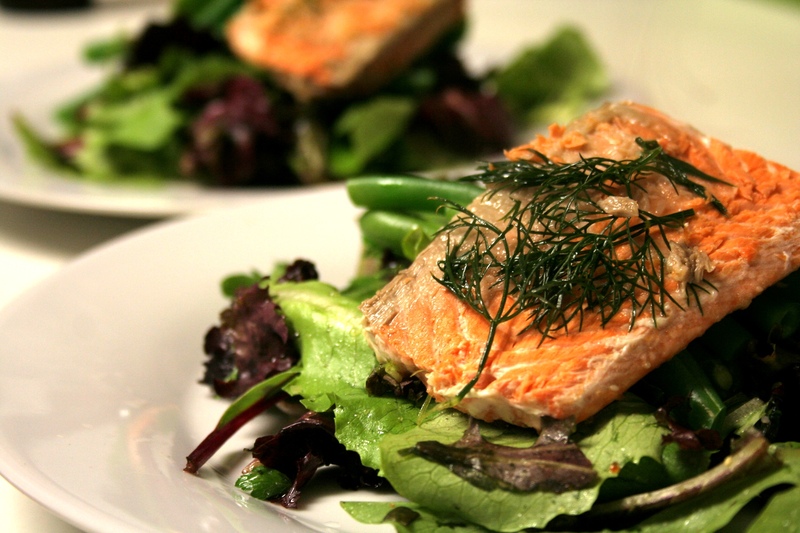 Toss lettuce with dressing, top with fish and serve. High protein, low carb, and one dirty pan…nothing better than that!